Cable continued its bearish trend today pushing down below the 1.53 line. A disappointing outlook on the UK’s service industry was enough to keep the sell orders coming in. 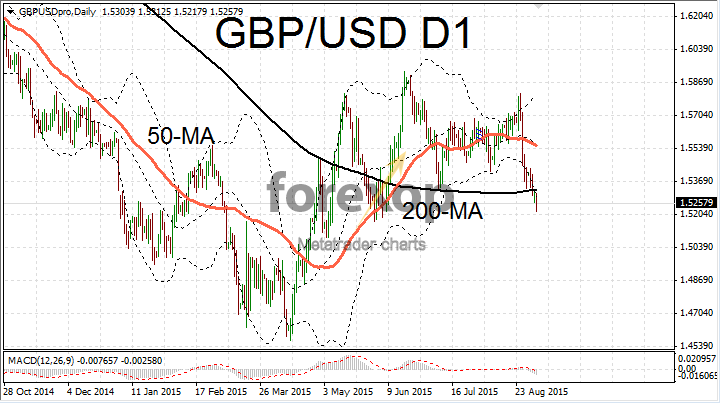 Bearishly, GBP/USD looks set to close below the key 200-day moving average line for the first time since early June. Sentiment turned more bearish after Markit delivered its latest survey which showed a marked slowdown in the UK’s service sector in August. The purchasing managers’ index dropped to 55.6 last month from 57.4 in July. With services contributing nearly 80% of the UK economy, any hint of a slowdown generally hits the British pound hard. Other than this month’s figures, the main concern among traders has been a downward trend since late 2013 when activity in the sector reached a peak at 62.6. 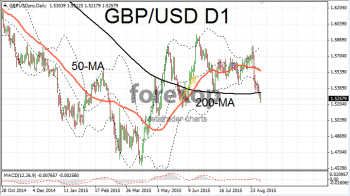 GBP/USD started to recover late in the session after reaching oversold levels at the bottom of the 1.52 area. Resistance is expected around 1.5275 and then at 1.5338, support is likely around 1.5145. EUR/GBP rallied strongly in favor of the UK pound today. EUR/GBP fell to 0.7274 shedding over one percent. The move came following ECB president Mario’s Draghi’s downbeat forecast for Eurozone inflation and growth. Oil recovered some ground today with Brent moving back up above the US$50 barrier. Chinese stock markets were closed today and this provided some respite to the browbeaten commodities sector. The Canadian dollar rallied on the back of the oil price but the “loonie” also gained a tail wind after some better than expected trade figures. The trade deficit narrowed to 0.6B CAD in July according to figures from Statistic Canada this being due to a higher than expected rise in exports. Adding to the cheer was the fact that non US countries appear to be taking up the slack as exports to these areas were up 2.9% on the month. USD/CAD fell to 1.32 a move of half of one percent in favor of the Canadian. Also in focus the Australian dollar saw red again today falling 0.5 percent against the greenback and testing the 0.70 support level again. Disappointing Australian retail sales were enough to send the Aussie’s sharply lower. After rallying later in the session, the Aussie turned south again following some strong data from the US services sector.